Visually impaired South africans are getting the chance to go to World Cup matches. Johannesburg, South Africa (CNN) -- Among the crowds at World Cup matches, blind South Africans are getting the chance to experience the thrill of international football. Six venues have equipped 15 seats with headphones that let visually impaired people hear specially trained commentators report live on the action. The service is available for 44 of the 64 World Cup matches, at stadiums in Johannesburg, Pretoria, Durban, Port Elizabeth and Cape Town. Tickets for the specially allocated seats are aimed at making the World Cup accessible to all South Africans. The Swiss National Association for the Blind and the South African National Council for the Blind (SANCB), launched the program with financial support from FIFA, football's international governing body. Among the blind football fans taking advantage of the initiative are Gert Jansen and Richard Mnisi, who has never been able to see. Mnisi told CNN, "I'm blind. It's the first time to go to the stadium to watch the match with other people. "When they give us the tickets, I was so excited because it was my first time to watch the game while I'm blind." Jansen said,"It was a tremendous experience for me since it was hosted on African soil for the first time so it was an experience of a lifetime. We listen to [a commentary] on earphones so that we can hear exactly what's going on in the football stadium. "We listen to [a commentary] on earphones so that we can hear exactly what's going on in the football stadium." Mnisi said, "I was wondering where I can listen to this match, because it's a huge crowd just making a noise. "They give us the headset and then [we had] to close our ears and then we must listen properly the match. 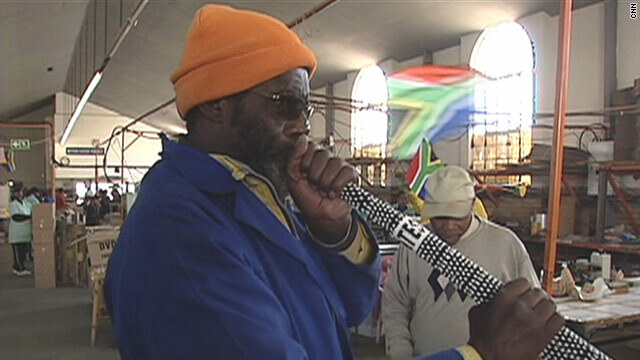 And then you can blow your vuvuzela while you're listening to the match, so I did experience that. "The blind man can compete with other people; you can go to the stadium with your radio and listen to the match and then blow your vuvuzela." Jensen and Mnisi both work at a packaging factory, along with other visually impaired South Africans. But many of their colleagues were afraid to take up the offer of free tickets, worried about how they would cope with the crowds and the noise of a World Cup match. Instead, these men and women, proud South Africans all of them, listen to the games on the radio while they work. Which is almost as good as being there.